What can we make of the reappearance of Maoist-era revolutionary rhetoric in China? This recent phenomenon was first noticed in Chongqing, China’s gateway to the west which is situated on the Yangtze River upstream from the Three Gorges Dam. This is the heartland of China. Chongqing is the political fiefdom of Bo Xilai, son of one of China’s revolutionary immortals. He is a rising star who has his sights set on promotion to the politburo when a new generation of leaders is elected next year. He is Chongqing’s Party Secretary. Shortly after his arrival, Bo Xilai stamped his mark on this municipality of 31 million people by implementing a campaign against corruption. The campaign was needed, and it netted high profile government and police officers as well as members of the local mafia. Cynics however, saw his campaign as a means of self-promotion rather than as a genuine desire to clean up Chongqing. Perhaps it was a bit of both. After the execution of the main offenders and the resignation of the mayor who purported to know nothing about the depth of corruption in his city on his watch, some strange things began to happen. For example, text messages of Maoist revolutionary slogans suddenly began appearing on residents’ mobile phones. “Where did that come from?” seemed to be the consensus of opinion on the streets. Then a local satellite TV station morphed into a propaganda vehicle for old leftist nostalgia. Calling itself China Red, this medium is now a political organ of the local Municipal Party Committee rather than an advertising-driven semi-independent entity. At face value, perhaps he has a point. Australian free-to-air television has a lot to answer for in terms of dumbing down our national culture. However, he let the cat out of the bag when he proposed the creation of an audience rating system that is more suited to, “the unique system of our country.” Everybody knows what that means. Today, Chongqing Satellite TV is building its China Red brand by showing more cultural variety shows, classic Party dramas, and programs such as: ‘Sing/Read/Speak/Convey,’ which is a shortening of the old slogan: ‘singing red, reading (Party) classics, telling (Party) stories, and passing along (Party) maxims’. Heroic revolutionary themes have replaced popular entertainment. 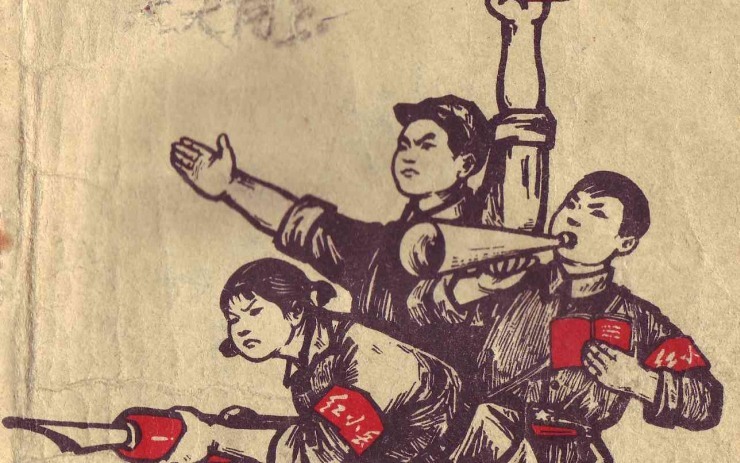 It seems that Maoist revolutionary propaganda is making a tentative official comeback. All of this begs the obvious question: Why this flirtation with revolutionary era populism? (e.g., communal singing of old revolutionary songs, the resurrection of Cultural Revolution dance, the display of old revolutionary slogans in public places and so on) – particularly when this embarrassing period in China’s recent history is one which the Party would prefer to forget. And who is going along for this ride back into the past, which according to the party’s own record of history is best forgotten? Older people seem happy to be reminded of the hopes they once held for a worker-driven socialist paradise. The nostalgia they feel for that era is all they have these days because most of them have missed out on China’s more recent capitalist revolution. Young people however, appear bemused by this historical baggage and are more likely to see this nostalgia for an unrealised dream for what it is – another crude attempt at political manipulation of the masses by a Party which, despite being the driving force behind rising economic success, remains insecure about its legitimacy. And well it should – history reminds us that wealth inequality and institutionalised corruption are regime killers anywhere. Not that China is at risk of widespread social unrest or any immediate threat of a Middle East inspired Jasmine Revolution. The nation is too nailed down for that to happen. In my opinion, this revolutionary rhetoric is all about keeping the lid on the socio/political pressure-cooker until power is transferred to the next generation of leaders in 2012. The old guard does not want its place in history tarnished by any surprises. Ordinary people who long for change can try their luck with the new guard. The recent arrests of well-known dissidents and the release of a couple of them under house unrest on the condition that they keep their mouths shut, (spare a thought for those less well-known dissidents who remain incarcerated), should be regarded as a preventative measure by a nervous state. Although the methodology is as crude as ever, it’s effective. That’s what this song and dance is all about.